Ancestry.com announced that the Family Group Sheets have returned. The purpose of the Family Group Sheet is to aid genealogists with their research. It appears that Ancestry.com removed the Family Group Sheet in February of 2016. At that time, Ancestry had put together short video tutorials to show people how to use newly introduced features. At that time, Ancestry.com stated that there was no specific release date scheduled for the return of the Family Group Sheet. It had been placed “under review”. The Family Group Sheet was returned to Ancestry.com on June 26, 2018. It comes with its core functionality intact. The new version includes styling updates to make it easier to read, some improvements to make it easier to use, and a convenient print option. 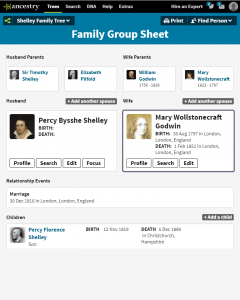 In the blog post, Ancestry.com walks people through how to use the Family Group Sheet view. Selecting the profile button for their focus person, or their focus person’s spouse, will take you to that person’s profile page. After receiving feedback, Ancestry.com announced that the Family Group Sheet can now be accessed from both the tree view and from a person’s profile page. There is a visual example of what the Family Group Sheet looks like included in Ancestry.com’s blog post about it. The family in the example is Percy Bysshe Shelley and Mary Wollstonecraft Godwin, who were married on December 30, 1816. 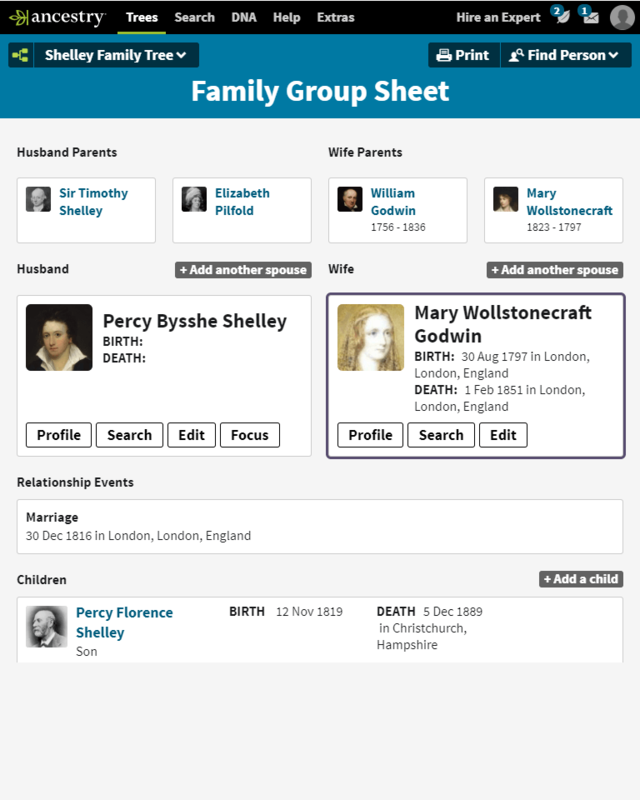 The Family Group Sheet includes some information about their son, Percy Florence Shelley.